Press on the "Talk" button and speak into the microphone. A green wave appear where the white spot was when you are speaking. 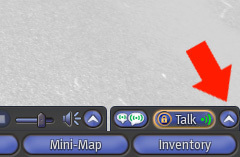 Click on the button next to the "Talk" button to turn on the Active Speakers panel. In the panel, you can adjust the volume level of different people by the sliding bar. 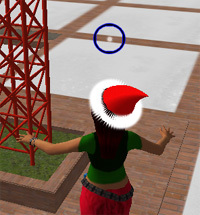 After the student set up according to the above instructions, they can play different roles in the virtual environment, and interact with each other according to pre-set scenarios. Loudspeakers and individual headsets with microphone are not part of the standard setup of computers in the PolyU laboratories. Therefore, students can ONLY use text communication in class, not voice. Class sizes over 20 students are not recommended. Copyright © 2009-2011 Hong Kong PolyU All rights reserved.